Southern England and Ireland on 2 V-Stroms. My girlfriend and I have traveled around Europe on motorcycles almost every summer since we met 16 years ago. I have always done most of the planning (taking into account her ideas and wishes) both before and during our travels together. 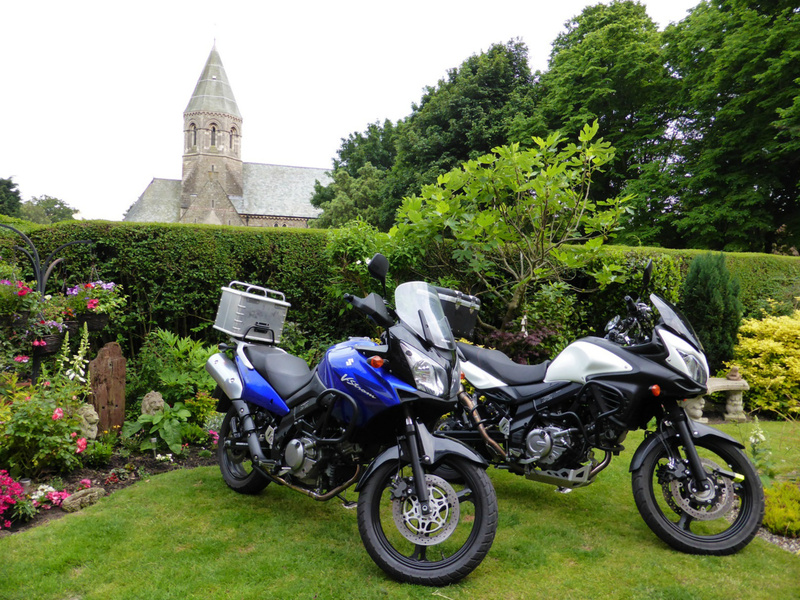 Riding and planning together involves some compromises to make both parties happy - in our case the main issue have always been, how much time we should spend riding compared to time out of the saddle to explore the places we visit (I never get tired of riding). Earlier this year I did a 2 weeks/9.000km solo ride to Morocco where I didn't have to make any compromises and thus got my desire for long days in the saddle saturated (for a time) - the result was, that my girlfriend and I agreed to let her decide everything and do all the planning for this year’s summer vacation. She quickly decided that the destination should be Ireland - one of the few places in Europe we still hadn't visited on 2 wheels. 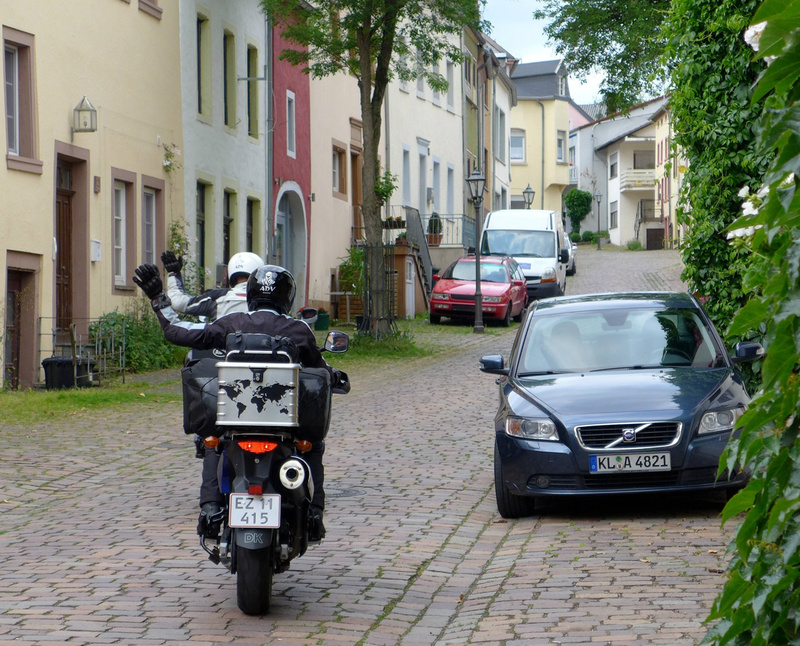 First stop on our way to Ireland was in Dudeldorf/Germany to say hello to Jim, that I got to know on my ride around Morocco 2 month earlier. It was great to see him again and meet his wife - and to introduce Katrine to the guy I had shared some of my Moroccan adventures with. After a pleasant evening in good company, a good night's sleep and a hearty breakfast Katrine and I were ready to continue our journey. There was only 450km from Jim's house to Calais where we had an evening reservation for the Eurotunnel (connect Calais in France with Folkestone in England), which allowed us to take scenic routes for most of the day. Riding the small roads we still made good time and ended up arriving at the train station in Calais almost 2 hours before schedule. Instead of spending 2 hours waiting for the train for which we had booked tickets, we were waved directly aboard a train that was just about to depart. 25 minutes later we disembarked in Folkestone and headed for a hotel in the center of town - taking it easy while getting use to the left-hand traffic. The hotel we had booked prior to leaving home, turned out to be a time warp from the 70s - but it was a nice place, and the owner told us to park the bikes in the garden, where he judged they would be safer than in the street. About a week before departure I was servicing my bike to make sure it was ready for the trip. When I adjusted the chain, I noticed that the axel nut ran tighter than normal when I loosened it. It turned out that the threads was damaged and both axel and nut needed to be replaced. When I tried to order the parts from the local dealer, they told me, that the axel was on back order from the Danish importer, and expected delivery time was 2-3 weeks – not good! In a situation like this the www can be a real life saver. 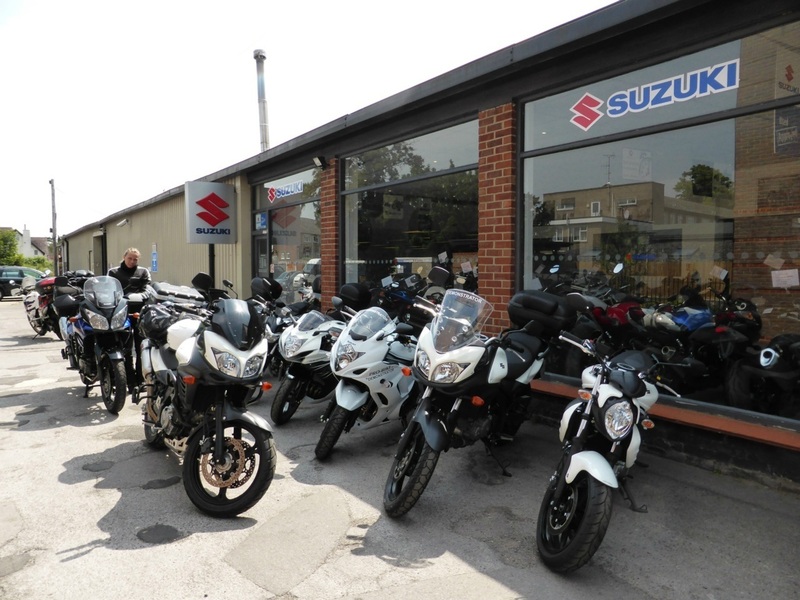 After sending out requests to several dealers around Europe, I finally got a positive response from Sam at Pro-Bike in Berkshire just west of London, who promised to get me the parts in time for me to replace them before departure. She was a real pleasure to do business with and I received the parts as promised. In her last email to me, she told me, that I was welcome to pop in for a coffee if I ever happened to be in the neighborhood. The next morning we packed the bikes before enjoying the first full English breakfast of the trip. 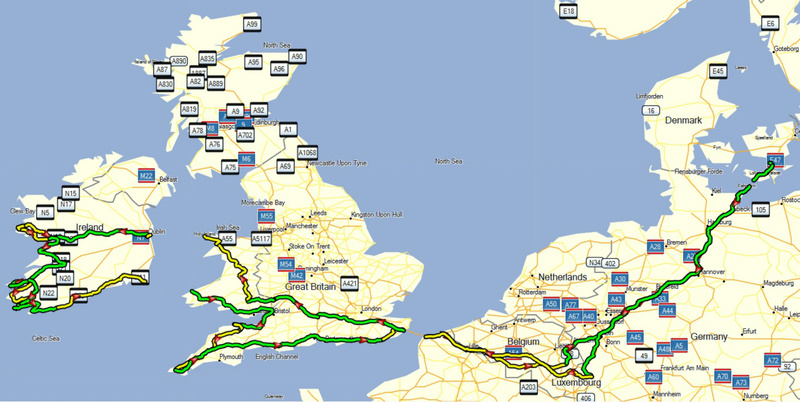 We then hit the highway to get around London in the direction of Holyhead where we were to catch a ferry to Dublin the next day. It turned out that Berkshire was on the route and around noon we parked our bikes in front of Pro-Bike and popped in to say hello to Sam and get the promised cup of coffee. Sam was surprised (to say the least) when she found out who we were – it was not every day that customers living 1000 miles from the shop dropped by to say hello. After a cup of coffee and a good chat with Sam and some of the other sales people working at Pro-Bike we continued our Journey towards Ireland. The rest of the day we took the smaller roads and before long we entered Wales riding beautiful twisty roads surrounded by stunning scenery. The night before we had booked room at a B&B located in Brecon Beacons National Park. The place turned out to be a real gem - a tiny 700 years old church converted into a B&B with 2 guestrooms in the attic. The host couple was a retired teacher and his wife who really knew how to make their guests feel welcome. We spend the evening doing a 1 hour hike to the nearest pub, to get a meal and a few pints – a nice way to build up an appetite. Just as we left the B&B heading for the pub, an Israeli couple arrived to check in at the other room in the attic. We met them again at the pub, and we ended up having dinner together and afterwards they gave us a lift back to the B&B in their car. Old church converted to B&B. When we fell asleep it was to the sound of rain drumming against the window - a sound which fortunately was gone when we woke up the next morning. This days riding started on some really nice roads going north through the Brecon Beacons National Park. The pace wasleisurely allowing us to enjoy the scenery and we often stopped to take pictures and soak up the atmosphere. We stopped for lunch at a cafe in Caernarfon right next to the town’s impressiv castle. If you are in to castles, Wales is the place to go – with over 400 in all shapes and sizes scattered throughout the region. Late in the afternoon we arrived at the port of Holyhead, where we were going to catch a ferry to Dublin. In the queue for the ferry we parked next to an Irish couple – Liam and Trish - who were on their way home from a 4-week motorcycle tour around Europe. 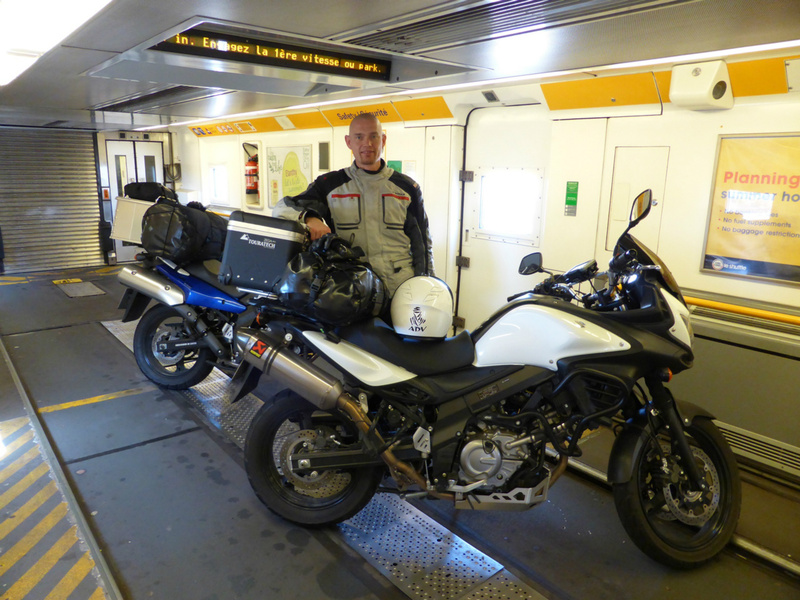 When the bikes were secured on the car deck we went upstairs to sharea tablein the salonduring the crossing. They came up with several good suggestions for places and routes we could explore during our stay in Ireland. Just beforewedisembarked in Dublin they invited us to stay at their place in Tralee if we came to that part of the country.We thanked them for the generous offer and exchanged phone numbers before we said goodbye to each other. One of the reasons for us going to Ireland was to visit Katrine’s brother who had moved to Dublin with his wife and kid a few months earlier. His wife is from Dublin and at the time of our visit they lived in her parents’ house. We checked in at a B&B nearby and spend the weekend hanging out with the family and playing tourists around Dublin. Monday morning after having spend 3 nights in Dublin, Katrine and I was eager to get back on the bikes and start toexplore Irelandin earnest. The plan for the day was to head north into Northern Ireland and then follow the coast west to Galway, where we had booked a room for the night – but that plan was soon about to change. We had just left the city and hit the freeway when the engine on my bike suddenly died. I pulled the clutch and was able to roll onto a lay-by, where I started to look for the cause. When I turned on the ignition the fuel pump didn't prime and the dash looked like above. It turned out that the fuse marked "fuel" was blown and when I replaced it with a spare that one blew too – I then decided to call roadside assistance. I was not thrilled with the situation. The V-Strom was only little over a year old with 20.000 miles on the clock and had been meticulously maintained, so I was really disappointed that it now left me stranded like this.After waiting 4 hours on a tow truck, I was picked up and transported to the Irish Suzuki importer (Priory Motorcycle) located nearby, while Katrine follow on her bike. 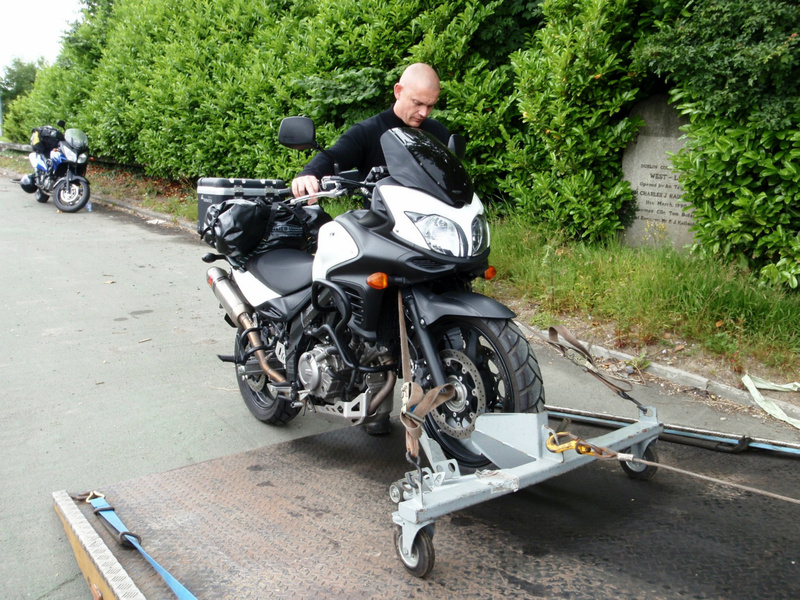 When we arrived at Priory Motorcycle they dropped everything to help me out and after 1 hour of troubleshooting, they discovered that there was a short circuit in the diagnostic wire at the back of the bike caused by rubbing against the supframe. The mechanics found that the problem was caused by the original routing of the wiring and would report the problem to Suzuki. He then repaired and relocated the wire, replaced the fuses and 1 hour later the bike was fit for fight and I was ready to hit the road. As the bike was still under warranty they didn't charge me for the work, so in the end the entire incident only cost me 6 hours, a lot of swearing and a missed opportunity to visit Northern Ireland this time around as it was now mid afternoon and we had to head directly for Galway in order not to arrive too late in the day. After a long and troublesome day we finally arrived at our B&B in Galway, where we were accommodated in a big and really nice room with a view over the bay, before heading for the local pub to get dinner and the mandatory pint of beer. Well deserved dinner after a long and troublesome day. We had booked 2 nights at the B&B as Katrine wanted to spend a whole day exploring the area west of Galway. 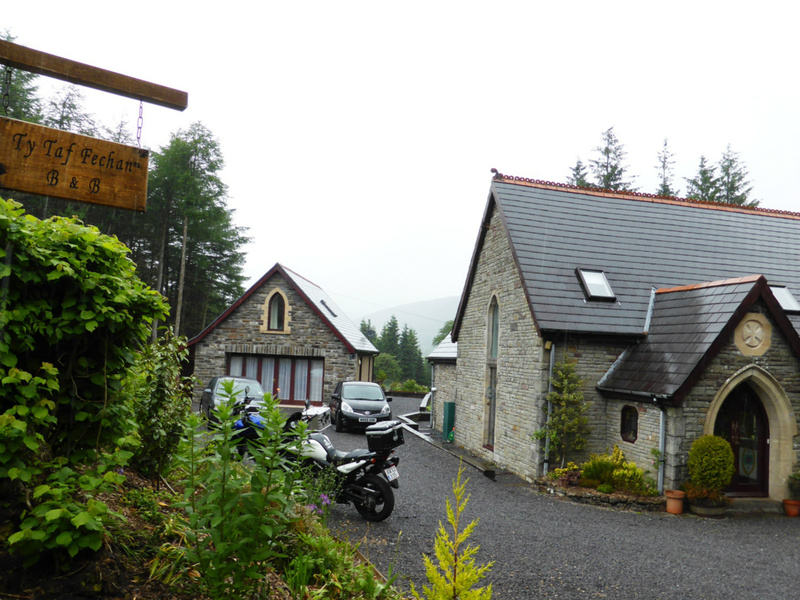 The rain was pouring down, when we left the B&B in the morning – not the best weather for motorcycle riding, but after the stay in Dublin and the shortened stage the day before, we enjoyed riding despite the wet conditions. We follow the coast west for a while before taking a more inland route NW heading for the first destination of the day – Connemara National Park. When we arrived at Connemara it was still raining heavily and combined with fog/low clouds, we really didn’t feel like parking the bikes and go for a hike in the park, as originally intended when we took off in the morning. 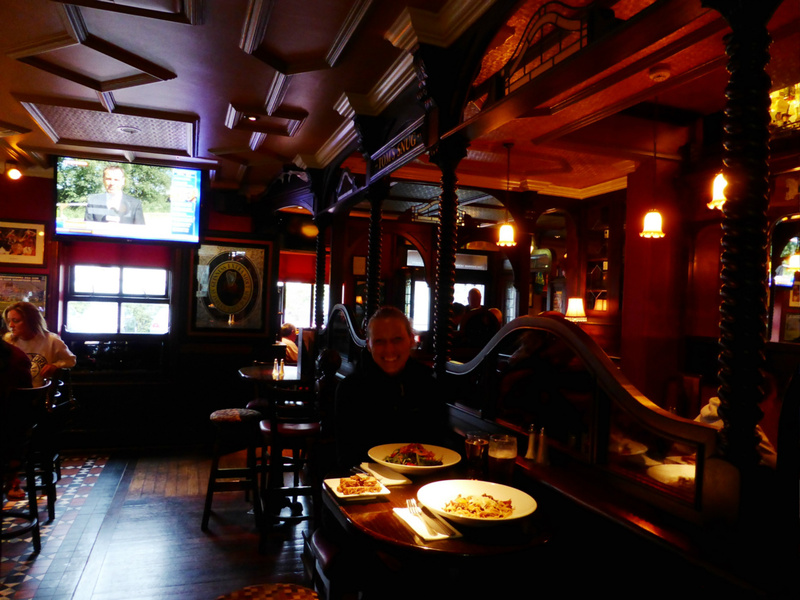 Instead we stayed in the saddles and follow the road around the park to Kylemore Abbey in the hope of finding a place out of the rain where we could get lunch and something warm to drink. 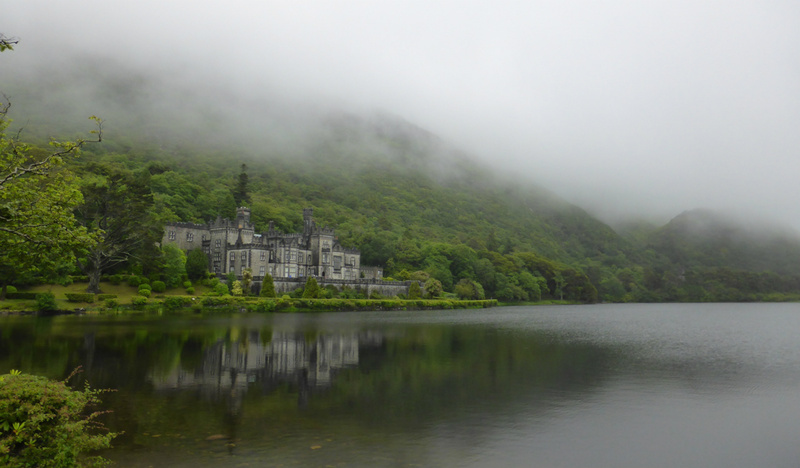 When we arrived at Kylemore Abbey the rain had subsided and we decided to use the opportunity to stretch our legs and take a closer look at the Abbey and the park surrounding it. After a good long walk we had build up an appetite and stopped by the parks Tea-house to get something to eat. Sometime later and with full bellies we got back to the bikes just as the rain started to pick up again. As we had had enough of riding in the rain for one day, we headed back to the B&B in Galway to get a warm bath and change into some dry clothes before spending the rest of the day exploring the city on foot. Not surprisingly our tour of the city ended at a pub for a late dinner and a pint of beer. Later in the evening when we got back to the B&B I contacted Liam (who we met on the ferry to Dublin) to ask him if the offer for an overnight stay in Tralee was still valid - it was and he invited us for dinner the next day. When we got up in the morning the weather was much better than the previous day, so the spirit was high when we packed the bikes after yet another hearty breakfast. After leaving Galway we followed the small roads south, alternately along the coast and inland. In the late morning we took a break at the Cliffs of Moher before continuing south. It was still early in the afternoon when we stopped at a gas station in Tralee, so we decided to do a bit more riding before visiting Liam and Trish. We headed for Dingle via the Connor Pass from which there should be great views of the area (one of the routes Liam and Trish had recommended). The weather was nice when we left Tralee but as we started to climb the pass we headed in to the low hanging clouds and when we reached the top the visibility was down to a few meters, making the riding somewhat interesting – so much for the great views, but the rolling clouds/fog provided a dramatic atmosphere while riding along the narrow road carved into the mountain side. 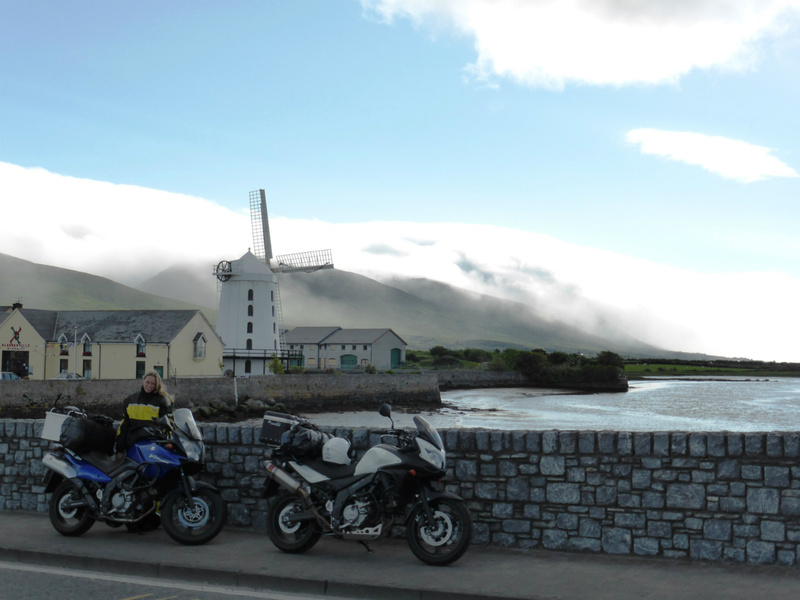 After a quick stop in Dingle on the other side of the pass, we took another route back to Tralee where we got a good view of the clouds rolling down the mountains we had just passed. Soon we arrived at Liam and Trish’s house where we got a warm welcome and it was great to see them again. When we last saw them in Dublin, they were riding a BMW R1200RT that was a bit worse for wear as Liam had been rear ended by a car near London the day before. The bike was still ridable but Trish sitting on the back had to hold on to one of the panniers to hold it in place and the bike had some dents and scratches. Liam who had been riding solo at the time of the accident had escaped with some bumps and bruises. Now a few days later he was still pretty sore and one leg was quite swollen earning him a sick leave. Besides the RT that was at the BMW dealer to get fixed Liam had a K1200LT and a R1150GSA parked in his garage – the last one was his favorite bike with +100.000 miles on the clock. 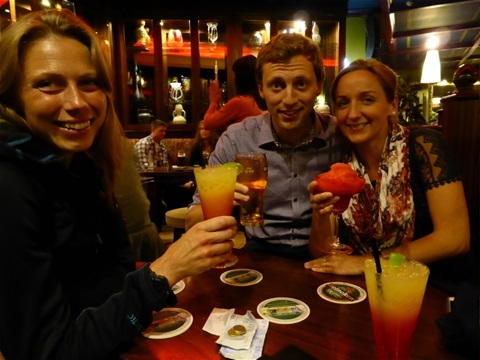 We spend a really nice evening with our new friends and (surprise!) ended up at the local pub drinking Guinness and whiskey until late in the night. Liam and Trish put us up for the night in 1 of their spare bedrooms upstairs, and the next morning Trish made the most wonderful breakfast – we were really getting spoiled. As we were having our breakfast Liam and Trish invited us to stay for another night (or more) if we wanted to, which we gladly accepted. Besides giving us more time with our hosts, it would also give us the opportunity to spend a day riding without luggage on our bikes and time to do some much needed laundry before we moved on. Our condition for staying another night was that they accepted an invitation for dinner in the evening at a restaurant of their choice – they agreed to the terms even though Liam did a lot of grumbling about how he preferred Trish’s cooking. They would have loved to join us for the days ride and show us some of their favorite routes, but Liam’s leg was still in too bad shape for him to feel comfortable riding a bike, so after breakfast Katrine and I headed out on our own. We had decided to spend the day riding The Ring of Kerry. It was a really nice ride on fun roads without too much traffic surrounded by beautiful scenery all day. In the afternoon we arrived at Killarney National Park, where Katrine decided that we should explore the park in a horse-drawn carriage - or a Killarney Jaunting Car as the locals call them. From Killarney it was only a short ride back to Liam and Trish’s house and we arrived just in time to change clothes before going out to dinner with them – Liam was still grumbling a bit. The next morning we got up early to say goodbye to Trish before she left for work and to express our gratitude for the hospitality she had shown us. When we had said our goodbyes, Katrine and I packed the bikes while Liam began to rummage in the kitchen in an attemt to make us a breakfast equal to what Trish had served the day before - the result was excellent! After breakfast and a pleasant morning in Liam's company, it was time to say goodbye, so long and thanks for everything. Our chance encounter with Liam and Trish at the ferry, their invitation to come and visit them, and not least our stay at their home in Tralee was a great example of the community spirit prevailing among many motorcycle riders. We feel privileged that we got to know them and really hope to see them again in the future. From Tralee we headed south towards the Beara peninsula which Liam had described as something really special. It turned out to be an even better experience than we had dared to hope for – the roads were perfect, the traffic light and the scenery breathtaking. As the afternoon drew to a close, we followed the coast to Clonakilty where we spend the night at a B&B in the center of town. The first stop on the next day’s stage was the BMW dealer in Cork only a short ride from where we had spent the night. 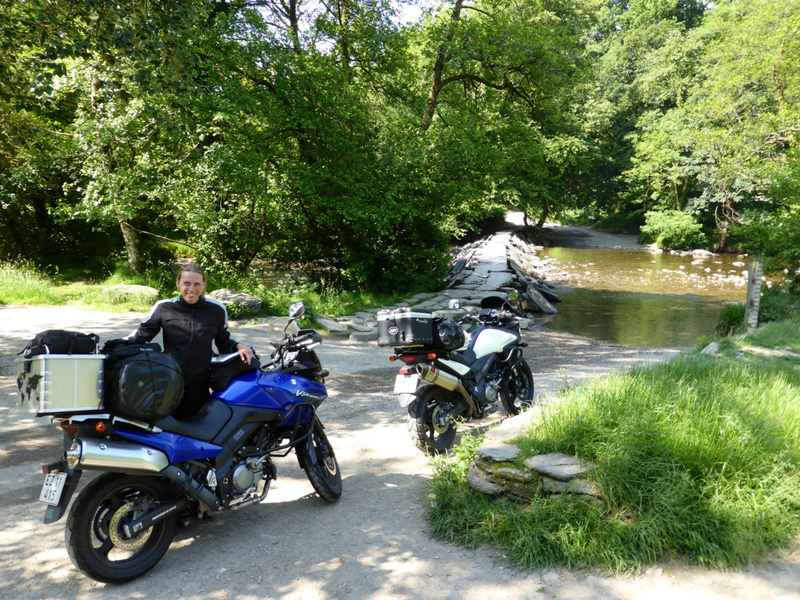 Katrine bought her V-Strom from new back in 2006 – now 8 years and 100.000 problem free km later she had decided that it was time for a new bike. 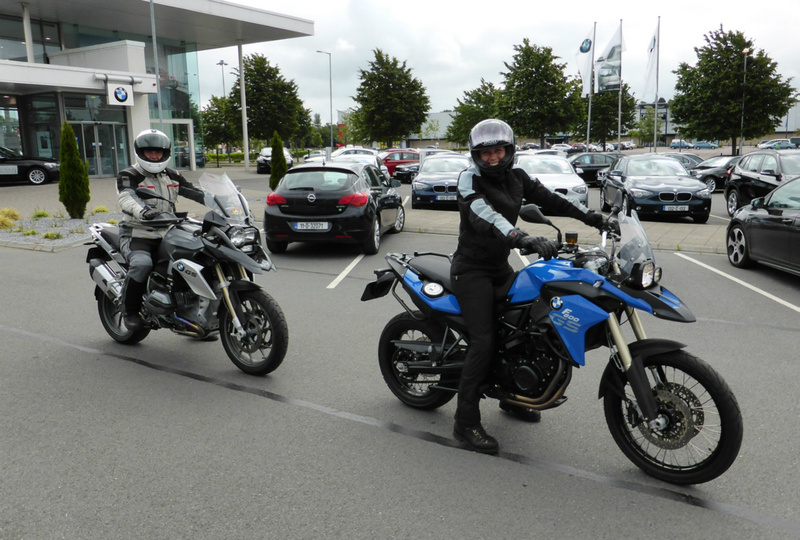 One of the bikes that she had her eye on was the new F 800GS and Liam had told us that there was a good chance for a test ride at Kearys Motorrad in Cork if we dropped by on our way back to England. When we arrived at the dealer we spend some time walking around the showroom to have a look at the various models. Besides the standard F 800GS Katrine had a look at the Adventure version of the bike (which she didn’t like) and I was looking for the new 1200GS that I up until then only had seen in pictures. As I couldn’t find what I was looking for, I asked the guy responsible for the motorcycle department if they had one in the shop – of course they had, but it was a demo bike parked in the shop. After a short chat he fetched it for me, and also sourced an F 800GS demo for Katrine so we could take both for a spin. Test rides on the earlier versions of the big GS have always left me a bit disappointed – they are good bikes but have for some reason failed to put a smile on my face. It was a different matter with this new model – it had a totally different “feel” to it and was a blast to ride. When we got back to the dealer after a 1 hour test ride Katrine confided to me in a whisper (at not to hurt the feelings of her faithful V-Strom) that she was head over heels in love with the 800 and that her V-Strom would be up for sale as soon as we got back home. I didn’t feel the same way about the 1200 as I really like my 2012 V-Strom and it’s the right bike for me at the moment – but maybe I’ll feel the need to get a 1200 with shaft drive sometime in the future..? After this little intermezzo in our journey we got back on the Strom’s and continued east along the South Coast of Ireland. We reached Rosslare Harbor a few hours later, where we bought tickets for the morning ferry back to England the next day, before checking in at a B&B 5 minutes from the port so we didn’t have to get up too early in the morning to catch the ferry. We started the day with an early breakfast at the B&B before heading down to the ferry. The crossing from Rosslare to Fishguard took 3½ hours, so it was around noon before we finally got England in sight. 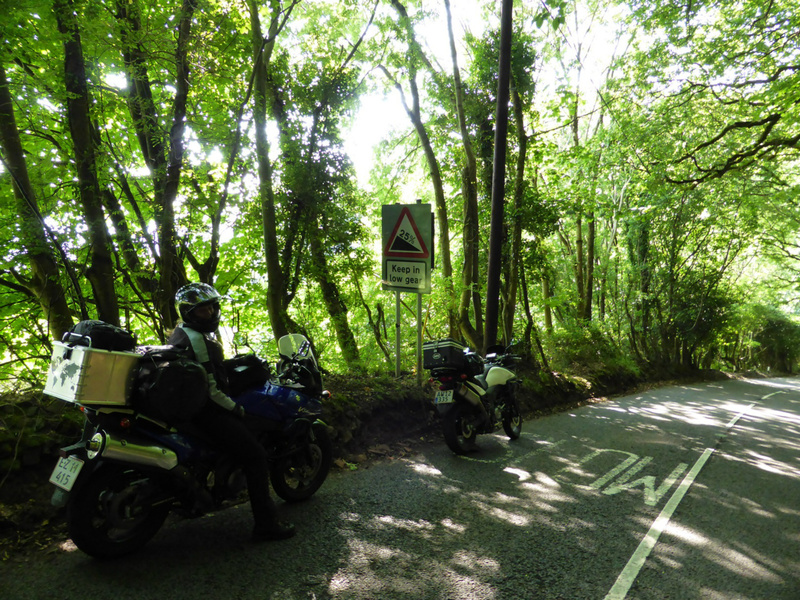 Shortly after we left the ferry we hit the small roads going west through Wales. 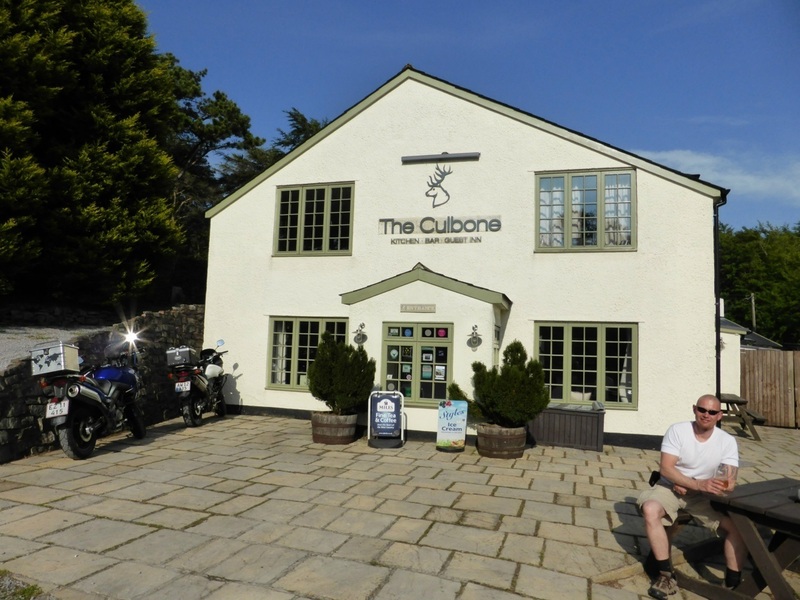 A few hours later we entered Exmoor National Park south of The Bristol Channel, where we had booked a room at "The Culbone" the previous night. The Culbone situated in the northern part of Exmoor is an award winning restaurant with guest rooms upstairs. It was still early in the evening when we had unpacked the bikes and checked into our room, so we decided to take a hike in the surrounding countryside before dinner - Katrine brought along a pair of binoculars in hope of spotting some of the local wildlife. 2 hours later soaked with sweat and in high spirits we returned to the restaurant just in time for a quick shower before heading down for dinner - a dinner that turned out to be just as delicious as we had hoped for. We went to bed that night unaware that the next day would offer the most interesting and challenging riding of the entire trip. It was still early morning when we were back on the bikes and ready to explore Exmoor. 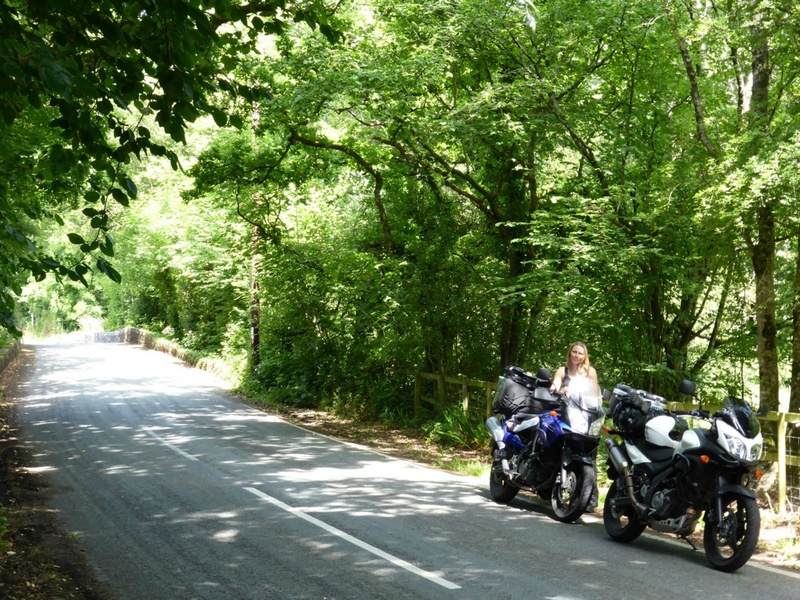 Exmoor National Park covers 267 square miles and is a mix of moorland, woodland, valleys and farmland - all crisscrossed by narrow single lane roads - often with extreme gradients – the perfect place to ride the V-Strom’s! There were several specific places/areas scattered throughout Exmoor that Katrine wanted to see before we continued our journey. She gave me the locations and then it was up to me to make a route on the GPS connecting them before we left the Culbone. 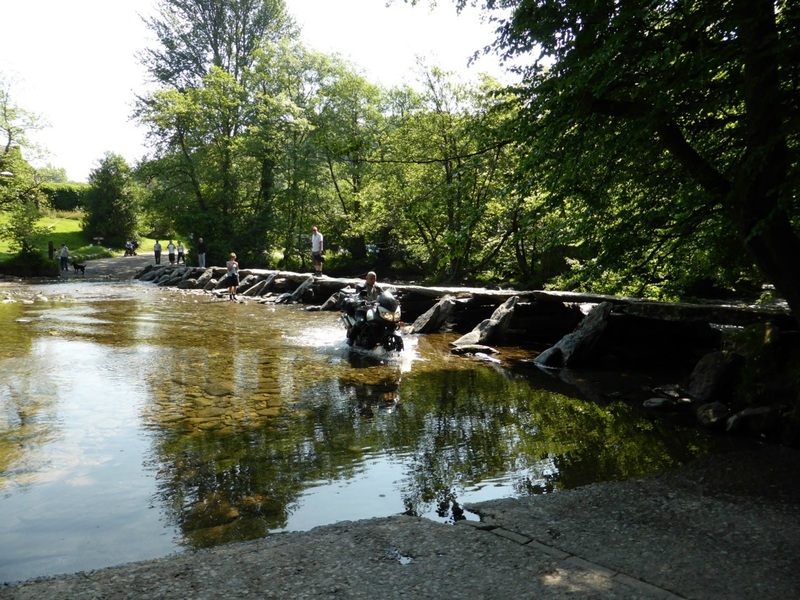 One of the places she wanted to see was Tarr Steps at the River Barle. As we approached the place halfway through the route, there were signs by the roadside indicating that the road ahead was not suitable for vehicles. On our map the road crossed the river, but when I zoomed in on the GPS the road ended at the river and continued on the other side – this looked interesting. We quickly agreed to give it a go and cross the river. Besides a small fort earlier in the day, this was the first time Katrine was going to attempt a water crossing on a motorcycle and she was very excited (to say the least). I’ve done several water crossings when riding off road on my Yamaha WR 250R, but it’s a different matter when doing it on a bike twice the weight and on street tires. But as the water was shallow and the only challenge was that the bottom of the river consisted of slippery fist-sized stones I felt comfortable and crossed the river first. I made it across easily so Katrine was a bit more relaxed (but still very cautious) when it was her turn. After this enjoyable little challenge we continued along the great roads of Exmoor. 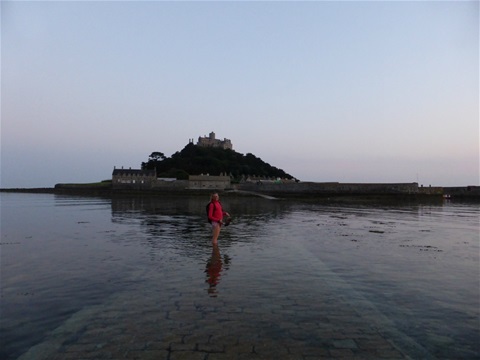 When we finally had seen what we wanted in Exmoor, we headed southwest to Cornwall, where Katrine wanted to visit St. Michael’s Mount. As all the B&B’s in walking distance to the castle was full (or too expensive for our taste) we checked in at a campsite just outside of Marazion. It was now late in the afternoon so we had to catch a boat as we wanted to see the inside of the castle before it closed for visitors for the day. 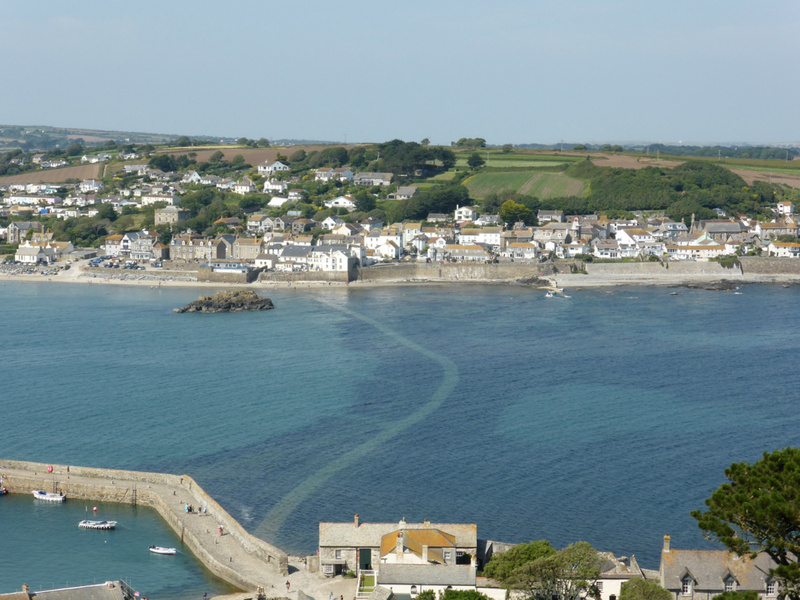 We spend the rest of the afternoon exploring the castle and the surrounding area that was now an island. On the boat back to the mainland the captain told us, that the tide would make it possible to walk the now submerged road around 10 pm. After coming ashore we walked back to the campsite to get a dip in the pool and a shower before going out for dinner. We had a really nice dinner (and beer) at a pub in the center of Marazion just next to the town’s church where the choir was practicing while we were eating – nice. It was almost 10 pm when we headed back down to the beach with full stomachs and in a good mood. The road to the Mount was now coming into view and we decided to use it for an evening stroll. Later in the evening when we hit the sack, we had no problems falling asleep after a long, eventful and extraordinarily nice day. Well rested after a good night’s sleep we woke up in the morning to yet another beautiful day in England. Contrary to the previous day, where there had been several things we wanted to see on route, the only plan for this day was to head east towards Folkestone. Late in the afternoon after a good days riding we arrived in Hastings where we checked in at an old hotel converted into a Chinese restaurant with an adjacent pub on the ground floor and B&B rooms upstairs. The place was located just north of Alexandra Park were we went for a walk before dinner. It was a large and really nice municipal park with different areas accommodating different kind of people - lawns for games and sports, tennis courts, neat flower gardens for relaxation, a small forest and even lakes where you could go fishing. Back at the “hotel” we had dinner at the Chinese restaurant where the food was excellent and plenty – the result was that we both felt like foie gras geese when we left the table. The next morning I was awakened by a kiss and a “Happy birthday” by Katrine. It was my 40th birthday and for the first time on this trip, it was entirely up to me how we were going to spend the day. This was our last day in the UK, so we started with a full English breakfast before getting back on the bikes. From Hasting it was a short ride to Folkestone and the train back to mainland Europe. When we got off the train in Calais it took a bit of getting use to riding in the right side of the road again after 2 weeks in the “wrong” side. The weather was bountiful (as expected on my birthday) and we had a good time as we rode east through France and later Belgium until we hit the Ardennes late in the afternoon. A few days earlier I had contacted Hetty at Baton Rouge to hear if they had room for Katrine and me if we dropped by on our way home. We stumbled across Baton Rouge by chance a few years ago and have stayed there several times since – and in that time we have developed a friendship with Ben and Hetty who owns and run the place. Baton Rouge is a Motorcycle inn (bikers only) located in the Ardennes in Belgium just north of Luxembourg. Besides traditional rooms the place has 2 Dormitories accommodating respectively 8 and 16 people. I have always loved the genuine “biker” atmosphere at Baton Rouge and it’s unlike any other place I’ve visited. As we arrived at Baton Rouge after a great days riding I was greeted with a birthday song and Hetty had prepared a special birthday dinner (and cake) for me and the other guests. One of the guests was Ben’s big brother who we had heard a lot about over the years, so it was nice to finally meet him. 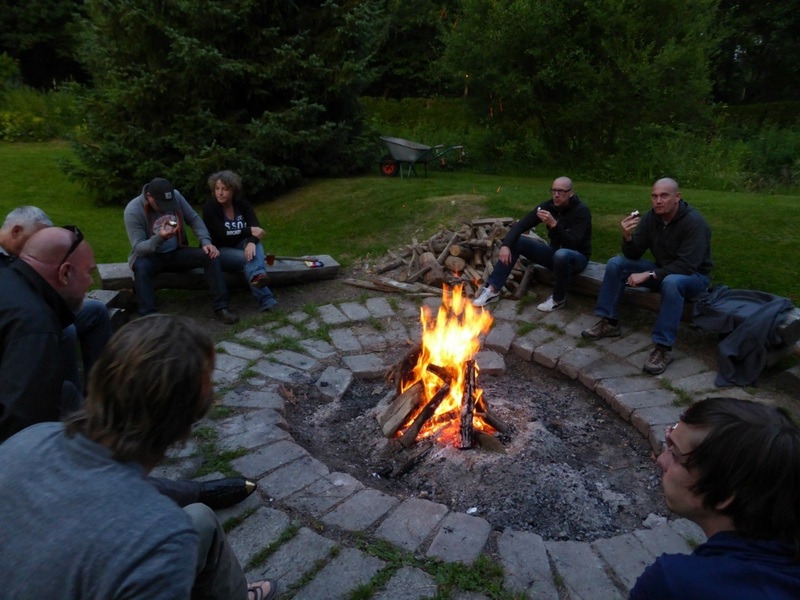 After dinner the rest of the evening was spent in the garden in good company around the bonfire. At the ferry to Denmark - almost home. Getting up the next morning was harder than usual and it took a hearty breakfast and plenty of coffee before we felt ready to say goodbye and get on the bikes. 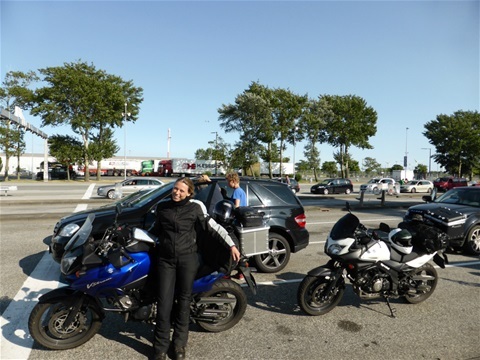 This was the last day of the journey and as it often happens when a trip draws to a close we were eager to get home, so when we exited the Ardennes we hit the motorway and gave the bikes some throttle. With a cruising speed around 100 mph it didn't take long before we had covered the 500 miles between Baton Rouge and the ferry back to Denmark. From the ferry it was only a short ride to our house. 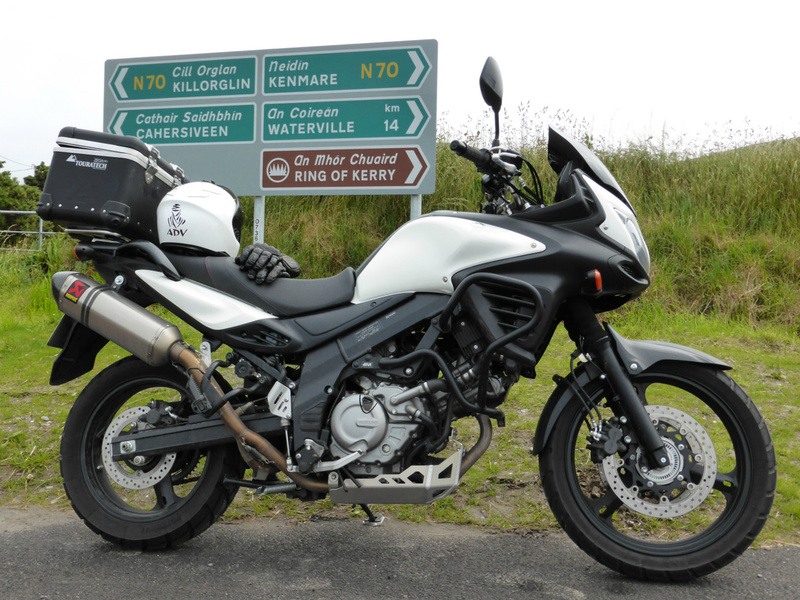 Besides the incident with the short circuit on my bike just outside of Dublin, the V-Strom's had performed brilliantly on the entire trip and proved just how capable and versatile touring bikes they are. The most prominent difference between the performance of the old and the new version of the Strom was fuel consumption - my bike (the new model) constantly used 15-20% less fuel than Katrine's. I did some videos on the trip that you can watch here.